As an established watch company whose heritage has been deeply influenced with automobiles (making their first dashboard chronograph for cars and aircraft in 1911) building a series of watches honouring such a sensational formula 1 driver makes so much sense for Tag Heuer. 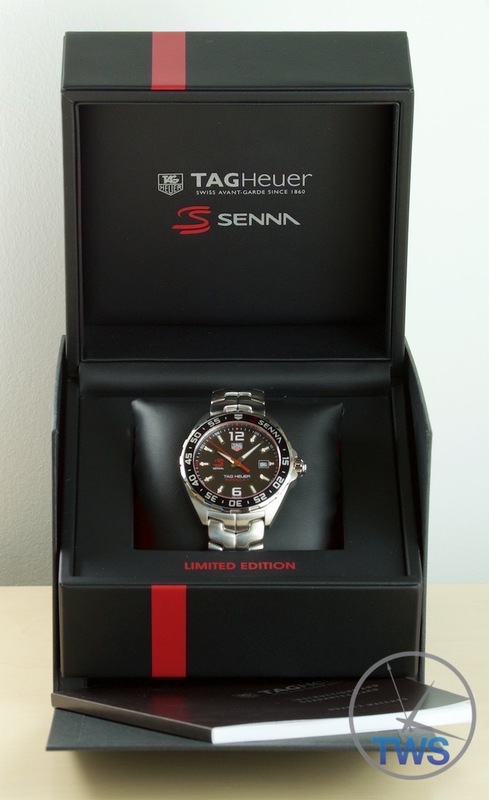 Buy this Tag Heuer Senna Special Edition Formula 1 Watch [waz1012.ba0883] [Sold Here] from our shop at a discounted price. 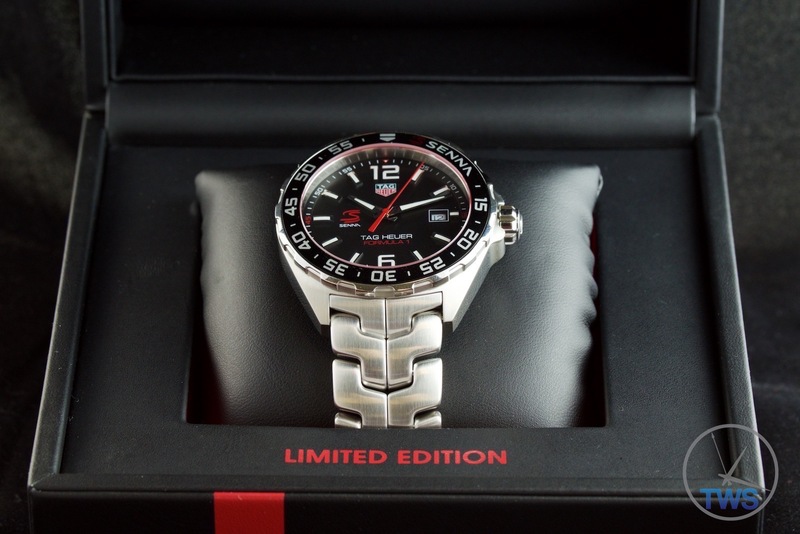 There is also a Chronograph version of this Formula 1 watch [Sold Here] and a Senna Special Edition CARRERA watch in black titanium [Sold Here]. First learning to drive his family’s Jeep around their farm, at only the age of seven, Senna showed an early interest in cars and a natural ability at driving them. Senna started his journey to extraordinary driving success with a cart made by his father using a 1-HP lawnmower engine, racing at the age of 13 against competitors several years his senior. Later after winning the South American Kart Championship in 1977, contesting the Karting World Championship from 1978 to 1982, progressing to entry-level Formula Ford 1600 in 1981, he nearly retired from the sport due to pressure from his parents to take increased responsibilities in the family business. Luckily he took up an offer to drive with a formula ford 2000 team in England; proceeding to win the 1982 British and European championship for that class. Then during his Formula 1 career, he would race for Toleman (1984), Lotus (1985–1987), McLaren (1988–1993) and Williams (1994). 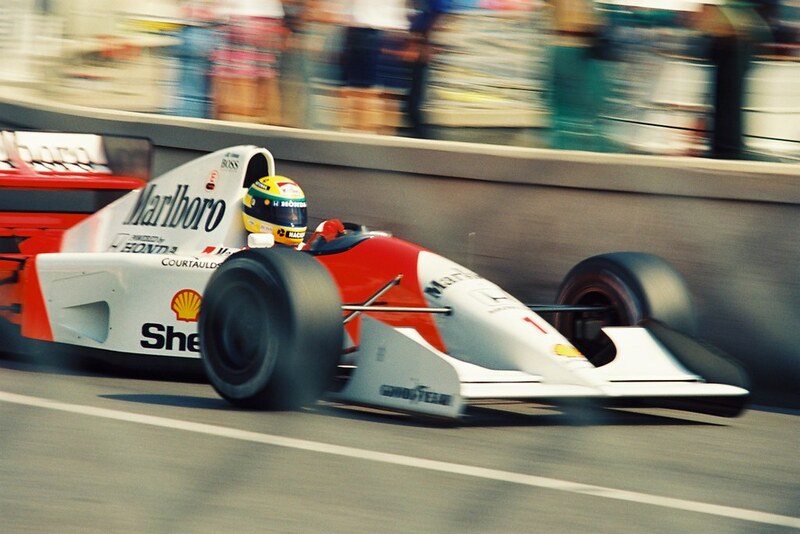 Throughout this time Senna was constantly rewriting the record books with his remarkable talent. During the 1988 season, Senna would win eight times besting the seven wins by Jim Clark in 1963 – a record that stood unbeaten for 25 years. And his 13 pole positions beating the previous record of nine by Nelson Piquet. In 1989 Senna achieved the feat of leading every lap in San Marino, Monaco, and Mexico, not to be equalled until Sebastian Vettel in 2012. His formula 1 racing career spanned 10 years from 1984-1994, with his early death being caused by a racing crash in the 1994 San Marino Grand Prix on the Autodromo Enzo e Dino Ferrari track. In spite of the rule changes that disqualified many electronic driving aids, he continued to race and prophetically predicted that“It’s going to be a season with lots of accidents, and I’ll risk saying that we’ll be lucky if something really serious doesn’t happen.” he continued to race despite the rule changes and serious crash of Rubens Barrichello during a practice, and death of Roland Ratzenberger while qualifying the day before his own race. Senna’s untimely death was not only seen as the death of one of the greatest racing drivers of all time but also considered to be a national tragedy by the people in his home county Brazil: with, the government declaring three days of national mourning to remember him by. Escorted by fighter jets, the plane carrying Senna’s coffin was flown back to his home country Brazil; landing, at São Paulo-Guarulhos International Airport, being met by both São Paulo’s mayor (Paulo Maluf) and state governor (Luís Antônio Fleury). The coffin was carried by soldiers from the Policia da Aeronautical to a fire engine, where his coffin would be taken on its 20-mile journey into the city, accompanied by eight cadets from the Military Police Academy in a mounted guard. Leading the funeral procession were 17 police motorbikes, and 2,500 further police lined the roads to keep them clear of the estimated 3 million people who wished to pay homage to Senna. This gathering of people is widely accepted as the largest recorded gathering of mourners in modern times – with the next closest thing to compare Senna’s passing away being the funeral of Diana, Princess of Wales, who drew over one million people onto the streets of London. There have been many racing drivers – but there has only been one Senna. 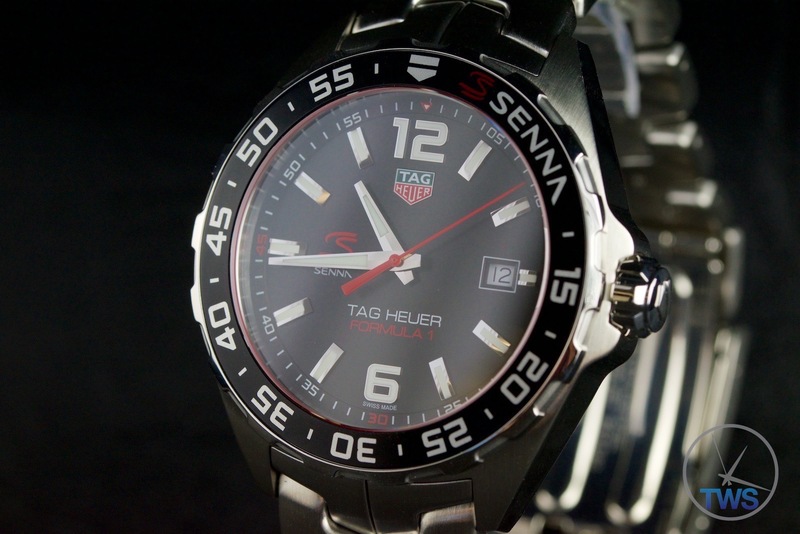 Tag Heuer’s history is rooted in chronograph complication watches and where these meet the racing industry. Senna is considered by many to be the best racing driver whom ever lived. 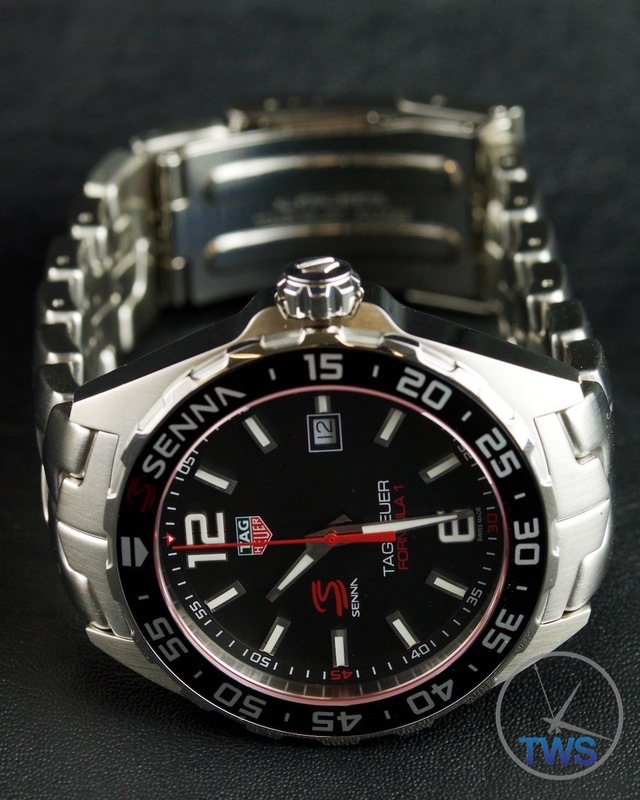 Senna was not simply a brand ambassador for Tag Heuer but someone who had a genuine connection to the brand he endorsed. 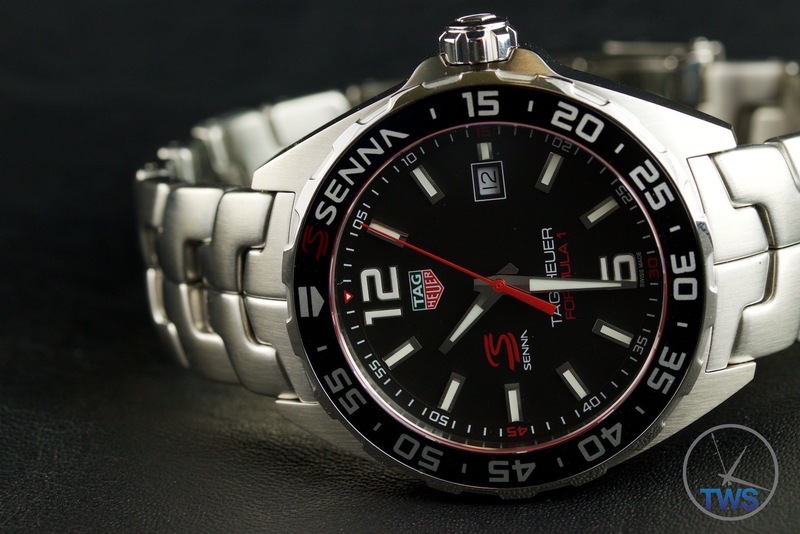 He is perhaps the perfect brand ambassador that Tag Heuer could even have, as once he joined McLaren-Honda in 1988 he not only promoted Tag watches but genuinely wore their watches himself, this relationship lasted even after he left the McLaren team, and in death, the Senna Foundation has continued what he began. 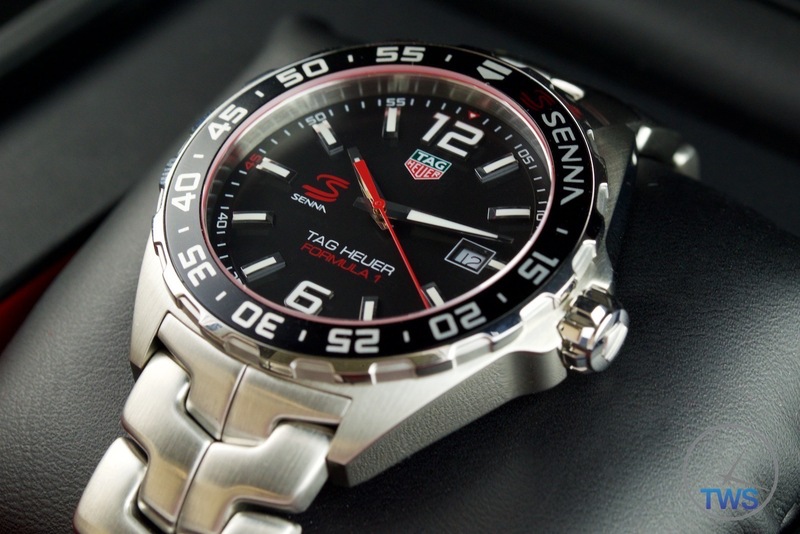 Of the three watches that Tag Heuer currently has honouring Senna, the Formula 1 is the most affordable between them. 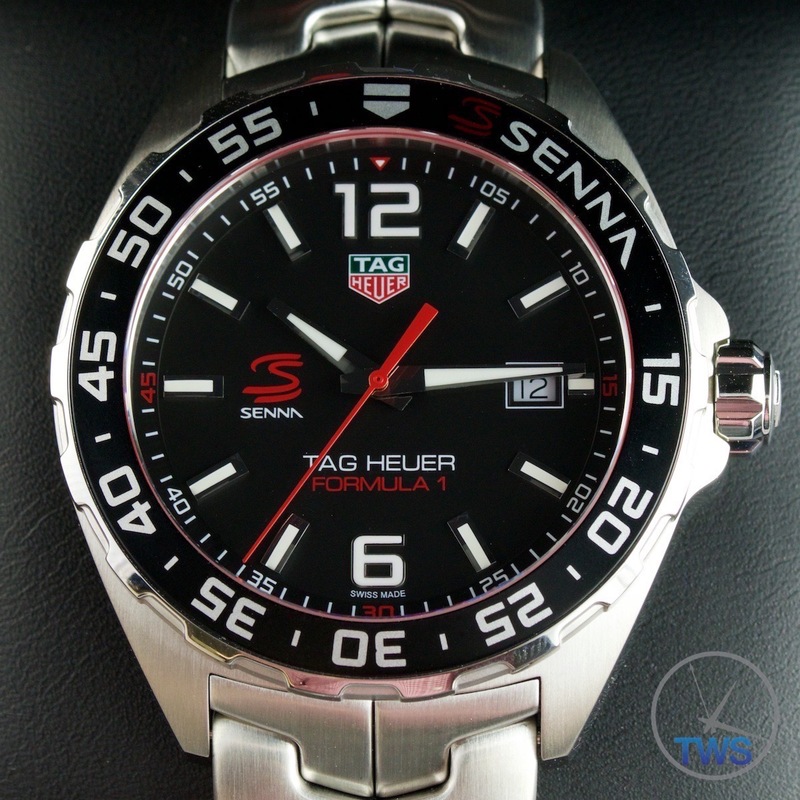 An additional £120 on the list price will get the chronograph version of the formula 1 watch; and, a Tag Heuer Carreara Senna special edition is also available in 44mm black titanium. 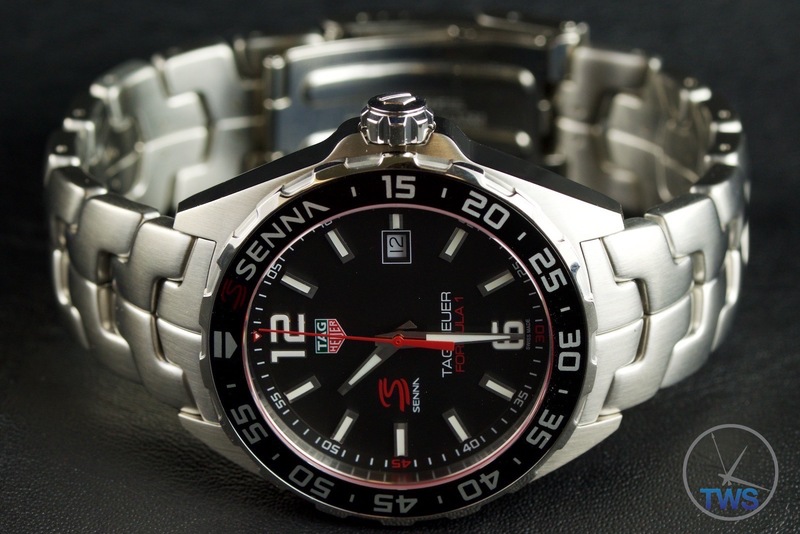 At 43mm wide this Senna Formula 1 watch is not a particularly small watch; but, might not be suitable for guys with really slim wrists. 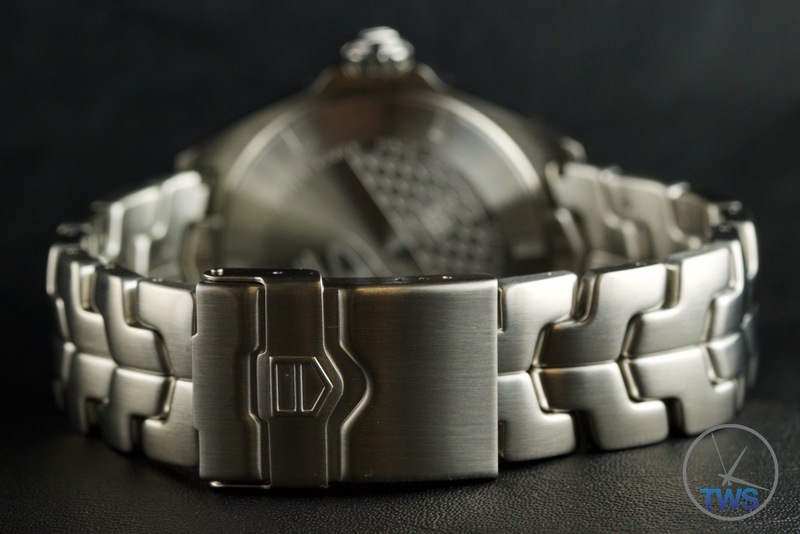 As you expect in this price range the casing and bracelet are entirely constructed out of brushed stainless steel – with the crown, bezel grip and case sides being polished for that desirable sparkle. Presented in a decent black cube of a box, with a racing stripe on the outside, the Senna Formula 1 sits on a black leather like cushion and is supplied with a small instruction manual. 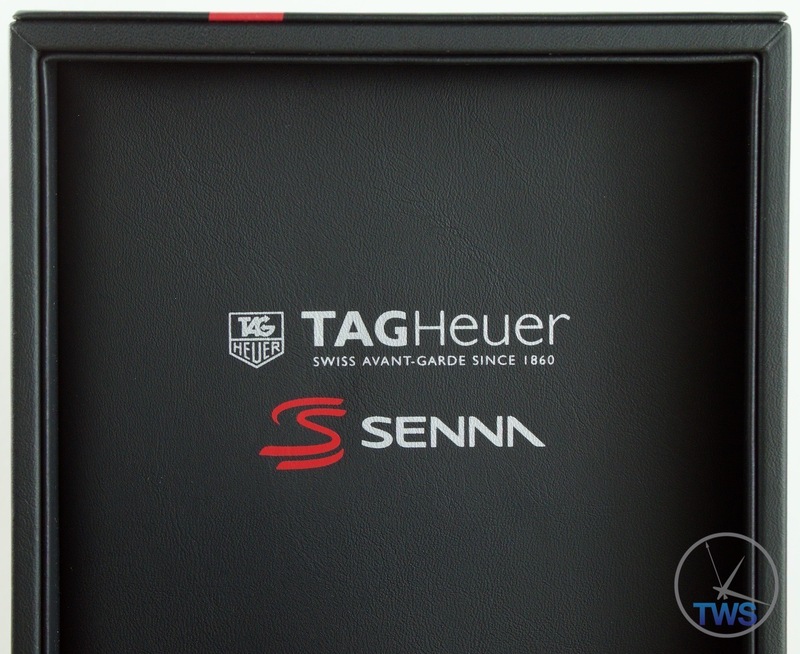 The internals of the box confirms that yes this is a Senna Special edition watch – with the printing of the Senna logo in red on the underside of the boxes lid. 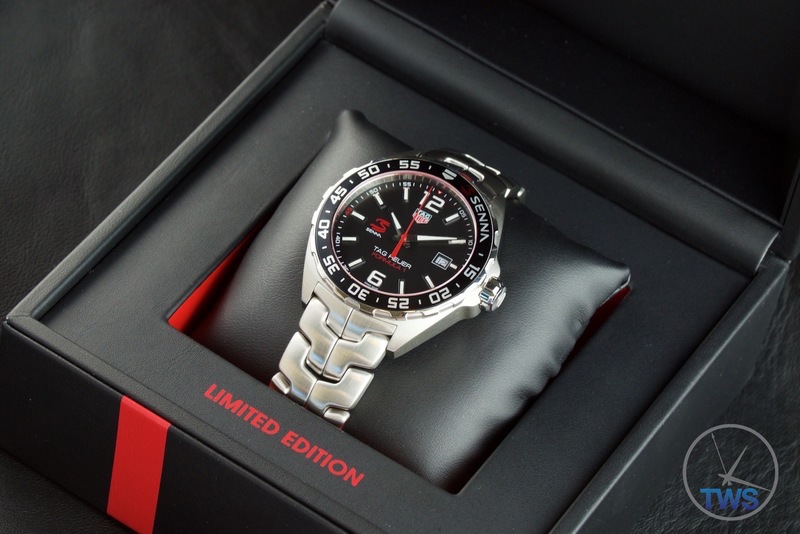 Aesthetically the main differences to the standard Tag Heuer Formula 1 Quartz 43mm are the totally unique s bracelet, the red and black colour scheme, Senna signature, and the fact that it’s a special edition watch. Its black dial gives it a versatile appearance which would be well suited to a wide range of environments. A luminescent compound has been applied to the white hour indices, Arabic 12 and 6 markers, and the tips of the hour and minute hands respectively – it glows in a not unfriendly green colour. 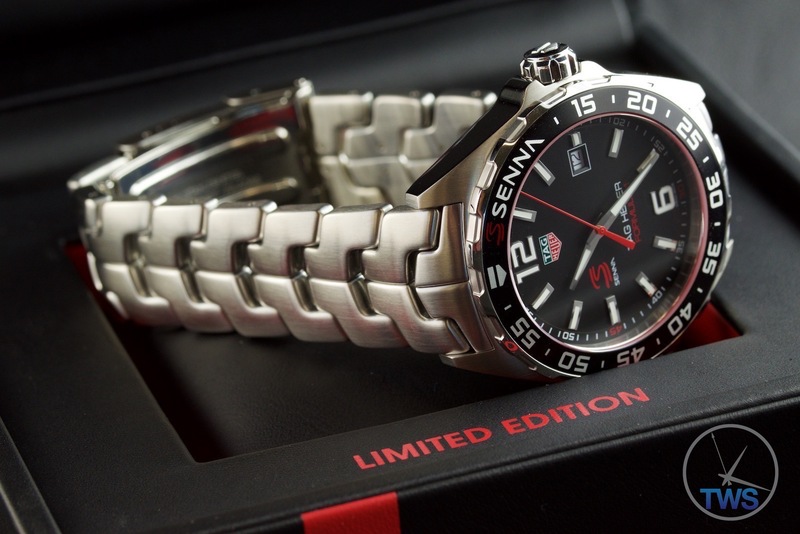 Available only on a metal bracelet the formula 1 Senna special Edition is rather peculiar by the shape of the links used to make up the bracelet – the famous legend strap! 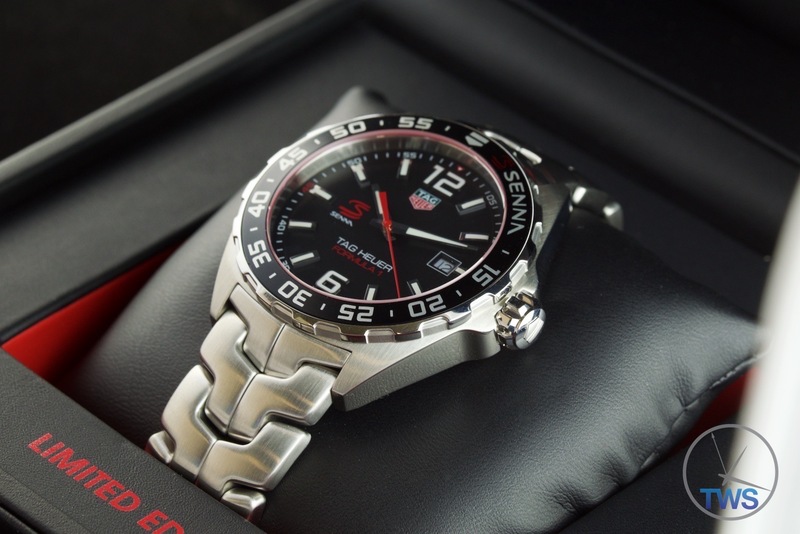 Made famous by Sennas wearing of the first edition of the TAG Heuer Link, they are made up from a series of S and Z-shaped metal links and gives a cool retro aesthetic; due to the strap being of the integrated variety it cannot be replaced with a non-legend strap. Luckily, the clasp is of the folding type with a safety latch – reminiscent of the old Rolex 114270 Explorer clasps of yesteryear, with its small form factor and several micro adjusting holes. 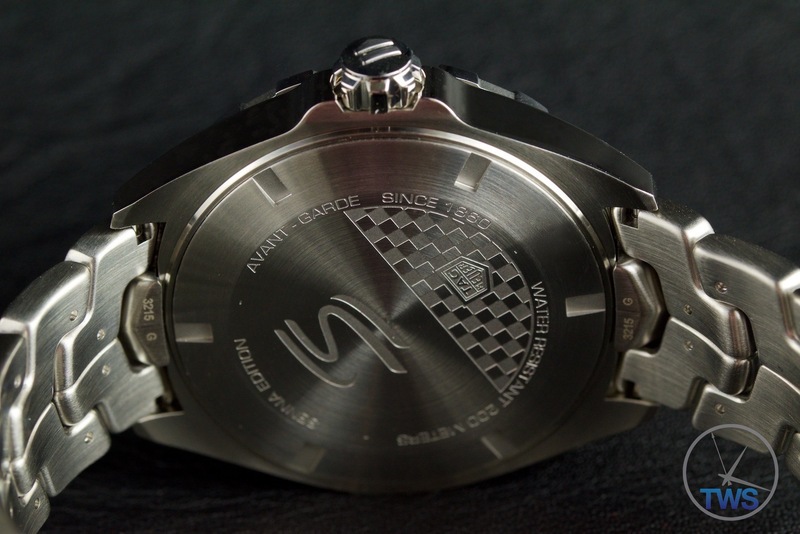 On the watches reverse, its screwed-in case back gives a generous 200m of water resistance when used in combination with the crown screwed down. 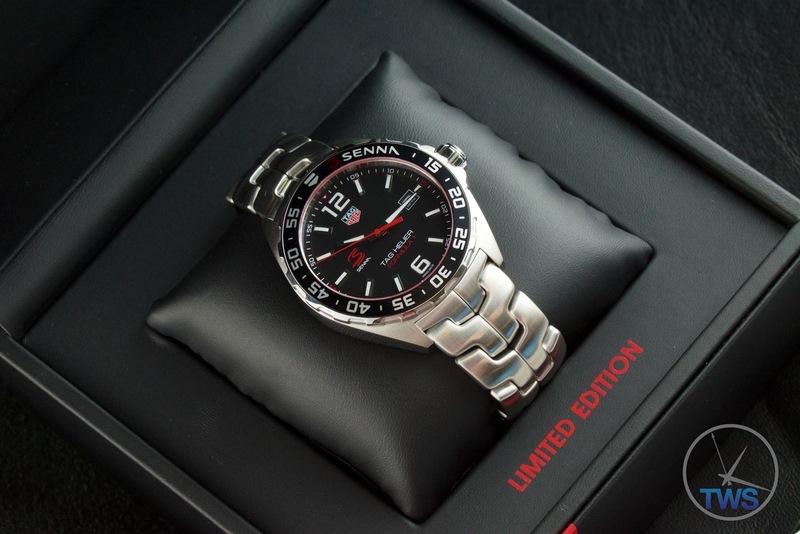 Engraved on the back are a racing checkered flag, Senna logo, and ‘Senna Edition’ text along with the usual Tag markings and water-resistance information. 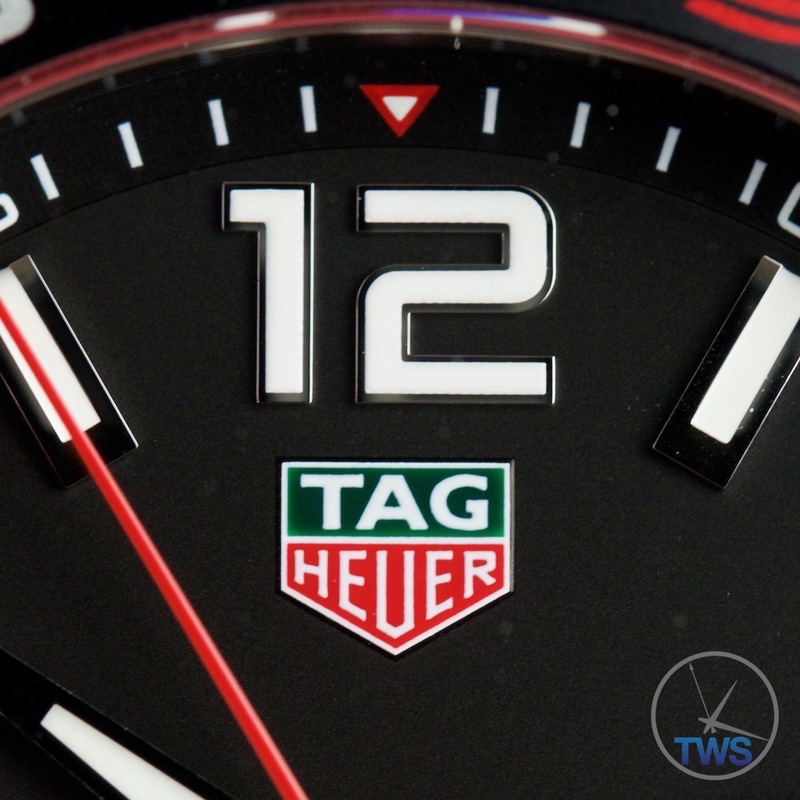 The Tag Heuer Senna Special Editions [waz1012.ba0883] dial is anthracite grey with a matching aluminium bezel insert on a polished stainless steel unidirectional bezel. 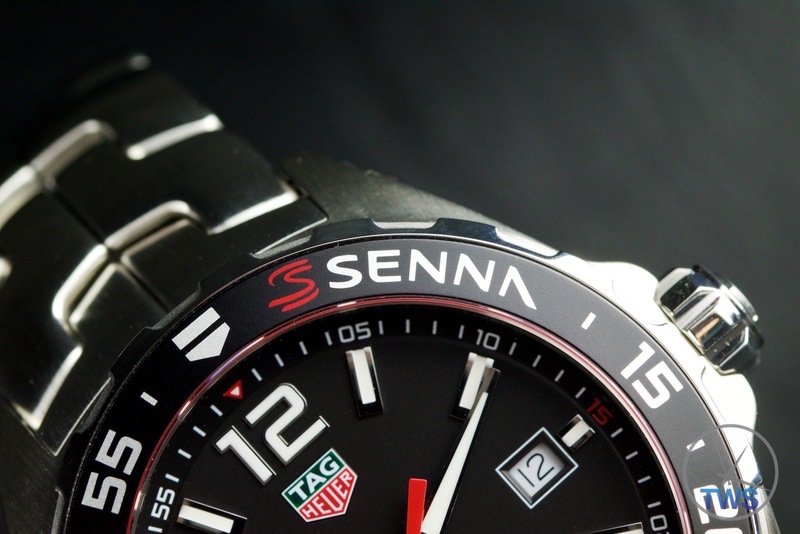 Senna’s famous stylised ‘S’ logo sits on the opposite the date window by the 9 and 3-hour markers respectively. And Senna’s influence in the watches design is also made known by the 5-10 marker on the rotating bezel – with his name emblazoned in bold capital letters. A red central seconds hand rotates continually measuring the progression of time, second by second, minute by minute, hour by hour, day by day – all independent on whether the watch is regularly worn or not. 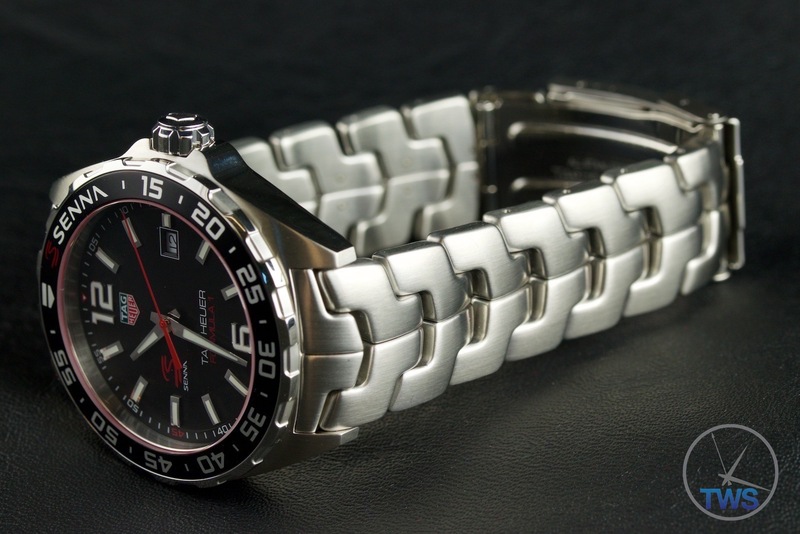 This quartz watch requires no maintenance other than a simple battery change every 2 or 3 years (Tag Heuer quartz watches indicate this by only progressing the second’s hand every 4 seconds). 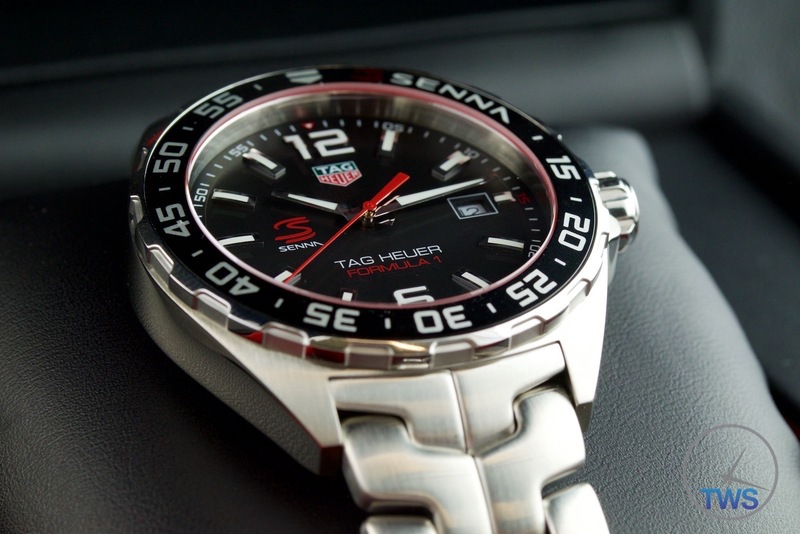 The Tag Heuer Special Edition Formula 1 watch is a tribute to the sensation that was Senna – Tag’s first brand ambassador. 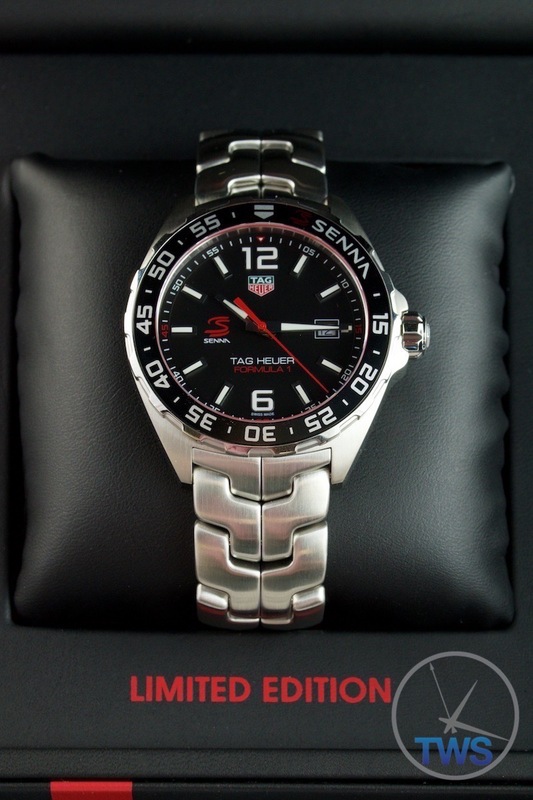 Buy this Tag Heuer Special Edition Formula 1 [waz1012.ba0883] watch from our shop [Here] at a discounted price. The chronograph version of this watch [caz1015.ba0883] is also available from our shop [Here] at a discounted price.